The following is the press release issued in joyful anticipation of the ordination of Proclaim member and ELM board member, Asher O’Callaghan. 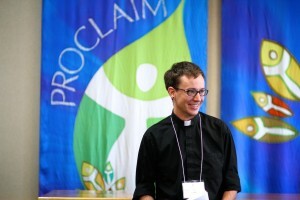 Asher O’Callaghan will be ordained Thursday, July 2, 2015 in Denver, Colorado to serve the Rocky Mountain Synod of the Evangelical Lutheran Church of America (ELCA). O’Callaghan is the first openly transgender person to be ordained through the regular process of the ELCA. Other openly transgender pastors were ordained prior to 2009 and outside the regular process of the ELCA. The ELCA voted in 2009 to ordain partnered gay and lesbian persons opening the door to widen the acceptance of gay, lesbian, bisexual, and transgender (LGBTQ) people in ministry (see http://www.cbsnews.com/news/lutherans-to-allow-gays-in-clergy/). O’Callaghan has been called by Zion Lutheran Church in Idaho Springs, Colorado to serve as their pastor. O’Callaghan is a member of Proclaim, an active community of nearly 200 Lutheran pastors, rostered lay leaders and seminarians who publicly identify as LGBTQ. Proclaim is a program of Extraordinary Lutheran Ministries, a social ministry organization that supports publicly-identified LGBTQ pastors, seminarians, and their ministries. O’Callaghan currently serves on the Extraordinary Lutheran Ministries Board of Directors. From Amalia Vagts, executive director of Extraordinary Lutheran Ministries: “What a joyful day for Zion Lutheran, for the Rocky Mountain Synod, and for the Evangelical Lutheran Church in America! Asher is exactly the kind of person that our church needs. His gifts for ministry and his witness as a transgender person continue to proclaim a message that God welcomes, loves, and calls all people.” Extraordinary Lutheran Ministries is a social ministry advocating for LGBTQ pastors and their congregations. Zion Lutheran Church in Idaho Springs, Colorado is a small but mighty congregation with a strong sense of community. They’re going through a period of revitalization and have a good mix of ages, single people, and families. Zion Lutheran has been a Reconciling in Christ congregation for several years, which means they intentionally welcome LGBTQ people. Idaho Springs is a small, mountain town located about one hour from Denver. The ordination service is scheduled for 7pm on Thursday July 2nd at House For All Sinners and Saints (which worships at St. Thomas Episcopal Church, located at 2201 Dexter Street, Denver, CO, 80207). Bishop Jim Gonia of the Rocky Mountain Synod of the ELCA will preside and Rev. Nadia Bolz-Weber will preach. Asher uses the pronouns him/he/his. This entry was posted on Wednesday, July 1st, 2015 at 8:48 am	and is filed under Blog. You can follow any responses to this entry through the RSS 2.0 feed. Both comments and pings are currently closed.